May 19, 2012  Chinese activist Chen Guangcheng, whose escape from house arrest sparked a diplomatic crisis between the U.S. and China, flew to the U.S. with his wife and two children. He reportedly will be studying law at New York University. 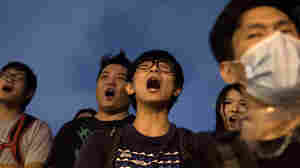 April 27, 2012  Chen Guangcheng escaped on Sunday, his supporters say. Today, a video surfaced in which he appeals to Premier Wen Jiabao to punish those responsible for his treatment.